Read Our Reviews: Timonium Odenton We are Masters of the Perfect Moment. We work with our clients to determine what that perfect moment looks like. We work to understand how our clients want their recipient to feel when presented with the award. Then we go to work to create the award to fit their vision and budget. 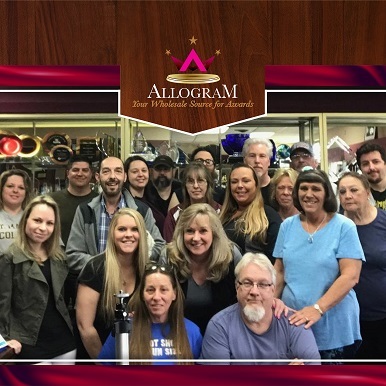 With two locations in Maryland, Allogram, Inc. specializes in creating customized recognition products and memorabilia crafted from genuine Walnut, Cherry, Oak, Marble, Acrylic, Mirrored Acrylic, Corian, Plastic, Brass, Aluminum, Bronze, and Vinyl. We offer fabrication services including laser engraving, routing, burnishing, full color direct UV printing, dimensional UV printing, vector cutting, sandblasting, chemical etching and sublimation. All of these services are provided "in-house" so we can control both production time and quality. Please click on each store, either Timonium or Odenton, for a virtual tour. Our creative graphics team can take your ideas and design the best award product for your application. Our precision computer driven equipment will diamond drag, burnish, route, sandblast, direct print, vector cut and laser engrave any personal message and logo into a variety of materials. With a large inventory of raw materials and component parts, we are able to produce your order not only quickly, but efficiently and at an unbeatable price. Our wholesale pricing structure allows you to save money and receive a quality product that will exceed your expectations. At Allogram, Inc., we pride ourselves on our commitment to produce quality workmanship, friendly and knowledgeable customer service and guarantee your satisfaction. It is our Mission to educate our customers on how to harness the power of recognition. We strive to provide the best products with the highest quality imprint possible, while educating and explaining the available processes and costs so our customer can make an informed choice. We offer suggestions and guidance on developing the imprinted message. Recognition is rewarding positive behaviors to get that behavior repeated. The benefit in eliciting desired behaviors from staff, athletes, students and volunteers is enormous. Our goal is to make our customers look good by delivering a product that exceeds their expectations. We are committed to providing the highest quality awards imprinted using the most striking method with a well thought out message at a competitive price. We are committed to technology. We believe technology allows us to provide and constantly improve our performance, efficiency, quality and accountability. We hold ourselves accountable for all our actions, products, principles and values. We operate under the highest ethical standards with honesty and integrity. We respect our customers, their budget, their time and their requests. We respond quickly and professionally offering our best solution to your needs. We are Masters of the Perfect Moment. We work with our clients to determine what that perfect moment looks like. We work to understand how our clients want their recipient to feel when presented with the award. Then we go to work to create the award to fit their vision and budget. With two locations in Maryland, Allogram, Inc. specializes in creating customized recognition products and memorabilia crafted from genuine Walnut, Cherry, Oak, Marble, Acrylic, Mirrored Acrylic, Corian, Plastic, Brass, Aluminum, Bronze, and Vinyl. We offer fabrication services including laser engraving, routing, burnishing, full color direct UV printing, dimensional UV printing, vector cutting, sandblasting, chemical etching and sublimation. All of these services are provided "in-house" so we can control both production time and quality.